Formulated to give your fiberglass or gel-coat the �Wet-Look�! UV resistant sealant for tough environments. Removes oxidation, gas and oil film, and fall-out in one easy step! Duragloss Marine & RV Polish #501 cleans, polishes, and protects fiberglass, metal, and painted surfaces. 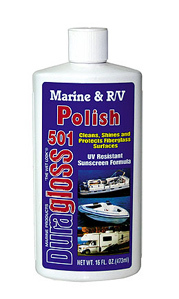 This powerful cleaners and high adhesion of Duragloss Marine & RV Polish give it the strength to stand up to the tough elements that watercraft and RVs face. This is product is not just a polish, but a powerful UV resistant sealant as well. Clean, shine, and protect your recreational investment with Duragloss #501. Don't let the name fool you. This is a great product on autos too. This is my go-to product for cleaning paint. It performs like an all-in-one product where it cleans, lightly polishes imperfections, and leaves a lasting sealant. 4-6 months protection afterwards easily. If you think your auto paint is already clean, just use this and see how much dirt comes off on your pad! Prosvery easy to use on and off. best cleaner I've used for car paint. Use this product on a good clean paint,it will make the paint sparkle even more..There's a few good cleaner/wax(sealant) around give Duragloss #501 a try you will always keep on using it..The good thing it's cheap with all Duragloss products and they work..